Lisa Smith has been synonymous with the Badwater Ultramarathon since the mid-90s when she competing at the front of the race and appearing on magazine covers. As an athlete, she has blazed trails across the globe, winning races like Marathon des Sables, and inspiring others to chase their own dreams. She set the precedent for competing with the top men, paving the way for later standouts like Pam Reed and Jamie Donaldson. Lisa’s name pops up regularly in the essay section of the race application as the person who inspired the applicant to run, or to compete in Badwater. Coaching athletes is another way Lisa touches athletes across the globe and her students compete every year at Badwater. Likewise for her work as a race promoter; Lisa knows what the athletes need and want in a classic race, and she delivers that with aplomb through Dream Chaser Events, the company she runs with her husband Jay Batchen. Naturally, they met through running and they ran the 2000 Badwater together as newlyweds. Lisa’s reach extends even further, far beyond sport, as she’s raised hundreds of thousands of dollars for AIDS Orphans Rising, an effort recognized in person by Pope John Paul II at the Vatican. As an athlete, coach, event promoter, philanthropist, and inspiration, Lisa is an ideal role model and ambassador for the Badwater Ultramarathon. She’s been a shining light at our race for 17 years, and though she has retired from competitive ultrarunning, she will no doubt be a welcome asset to the race for many years to come. 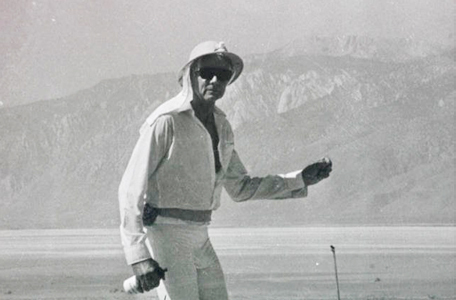 Why Badwater: The challenge, the people; the desert is where I feel most at home. I love the course and I love Ben and Denise Jones who have inspired me since my first day in Death Valley in 1995. Also, AdventureCORPS always has the most amazing volunteers. As a race director myself, I know all the time, effort and dedication that goes into putting on a successful event. They are very much appreciated! Funniest moments? Laughing so hard with my crew until I threw up. Sand storms where you are being thrown backwards and all you can do is laugh. Many moments when you would rather cry but choose to laugh: getting a flat tire, hearing people use all kinds of swear words when in there every day life they never swear. Coaching: I have coached so many people for Badwater: I am coaching four for this year’s race and I have coached every year. My coaching started years ago with coaching high school, then college, and it grew and grew as I learned and learned and learned: Not just through experience but through education. I have coached many of the top runners at Badwater, even Marshall Ulrich and Ray Zahab! I love to coach and even more so now that I have retired from racing! 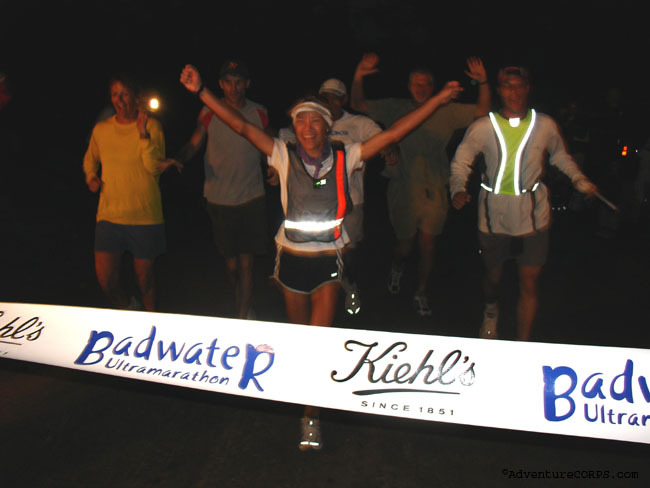 Badwater Life Lessons: Badwater was my first ultra and my last. I went from a marathon to 135 miles. I fell in love with endurance and distance running. Badwater taught me that it is not really about the race, yet a journey that will stay with you for the rest of your life. I have learned to trust other people who are there to help you, I have learned that most of the time you can work through about anything. I have learned that a “DNF” does not mean you did not finish, it means “MTRC”: Made The Right Choice and learn to race another day. There are reasons people don’t finish a race. We all start a race with the intention and desire to finish. Something goes wrong along the way and you must make a choice that is right for you! Marshall Ulrich got me into my first Badwater and he is still one of my best friends, more like a brother to me. The relationships and bonding with people that really do care about you will stay in your life forever. 1995: 2nd female and 4th overall in 41:24:31. 1997: 1st female and 3rd overall in 37:01, a new women’s course record. 1998: 1st female and 4th overall in 37:33. 1999: Featured in the film, “Running on the Sun.” Finished unofficially in 48:24 after receiving IV fluids. 2000: 3rd female and tied for 17th overall with her husband Jay in 43:23:56. 2002, age 41: 4th female and 10th overall in 40:28:22. 2003, age 52: 11th female and 33rd overall in 52:11:39. 2006, age 45: 13th female and 55th overall in 49:23:49. Ran a Badwater Double. 2007, age 46: 8th female and 43rd overall in 41:54:17. If any one person has “seen it all,” literally, at the world’s toughest foot race, it’s Dr. Lisa Bliss of Spokane, WA. It all began in 2002 when she served on the support crew for Steven Silver. He notched his sixth and final finish that year, but Lisa’s long love affair with Death Valley, Mt. Whitney, and the Badwater Family had only just begun. In 2003 Lisa returned to head up the race’s first ever Medical Team, an important step in the evolution of, and focus on safety and professionalism for, the 135-mile foot race held in the world’s most inhospitable environment. In 2004 she organized the Medical Team before the race, then toed the starting line as competitor. She placed 3rd woman and 15th overall in her rookie debut, with an impressive time of 37:41:48. In 2005 she returned as Medical Director, while also heading up the “Study on Fluids and Electrolyte Balance: Hyponatremia in Ultramarathoners,” enlarging on her career in the science of ultra sports, something which would lead her to presenting several years’ worth of research findings and making her an in-demand speaker at sport science conferences. Entering 2007, Lisa had crewed once, competed once, directed the medical team for three years, and conducted two years of scientific research at the race. Having seen and done and learned so much at Badwater, literally nobody knew what she knew about surviving, and succeeding, at Badwater. It was time to get back in the arena as a competitor and put all that knowledge and wisdom to good use! The 2007 race was never easy for Lisa; she had to stop twice to tend to major blisters, and she battled through a variety of challenges. But, aided by a crew of close friends, she pressed on, racing towards her own vision of her highest self. At mile 72 at Panamint Springs, she was three hours, 25 minutes behind the women’s race leader, a rookie fireball named Jamie Donaldson. As the miles and hours passed, Lisa discovered that she was getting stronger and stronger. On Towne Pass she had been the fifth woman, but from there on she started passing her rivals one by one all the way to Lone Pine where she finally caught the now ailing Jamie Donaldson. “Maybe they just went out a little too hard. Maybe I benefited from all those long stops I was taking to tend to my blisters and tendon problem. I don’t know, but at around 90 miles I started to feel real good and just began running. I must have had the fastest woman’s split form Darwin to Lone Pine. I ran the whole way,” said Bliss after the finish. Bliss passed Donaldson at Lone Pine, 122 miles into the race with only 13 miles remaining, and went on to win with a time of 34:33:40. Everybody was happy for Lisa, even the competitors she’d passed on the way into Lone Pine and on the way to Whitney Portal. Never one to bask in glory, or to try to “defend a title,” Lisa returned to Badwater in 2008 and 2009 to again head up what had become, with her direction and inspiration, the finest Medical Team at any ultra event. That same Medical Team from 2009 is back in 2010, with one new addition, proof that Lisa is a great leader who brings out the best in people who want to work with and for her. Over nine years, Lisa poked and prodded ill-stricken racers (and crew members and even race sponsors), who, more often than not, were able to complete their races after receiving care from Lisa and her team. She saw athletes at their worst, she took care of them with an ever-present smile, she observed, she learned, she listened, she put her food down whenever necessary, and she has done her best, always, to help the Badwater Ultramarathon remain a safe and respected race. For that, and so much more, we are thankful. Badwater University • Hall of Fame • Link ? 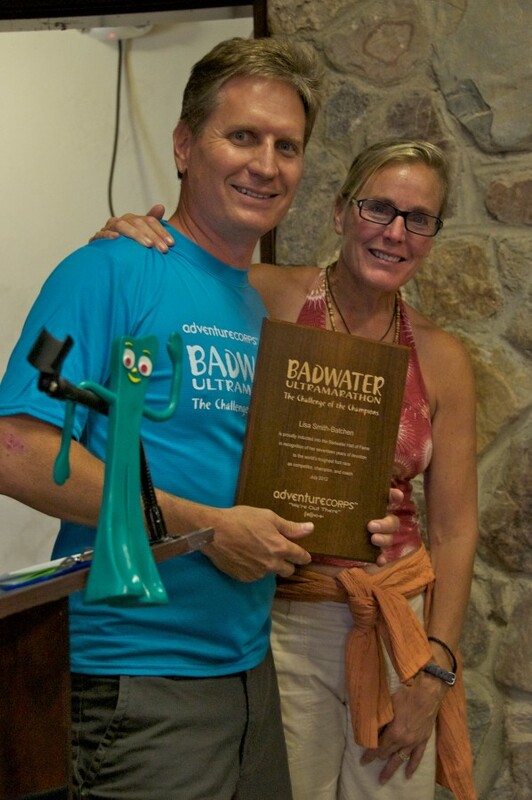 In recognition of their 17 years on the race course as athletes, camp hosts, volunteers, crew members, race ambassadors, and Mayor and First Lady, Ben and Denise Jones were inducted into the Badwater Ultramarathon Hall of Fame in July, 2007. Both of them are three-time official finishers, as well as training camp hosts and mentors to many Badwater runners. and various ultrarunning and ultracycling events. Click here to check out his many great photos! My introduction to Death Valley was in talking to several great aunts who first went to Death Valley in the ’20’s via a Los Angeles-to-Baker train line. Along the way were the Harvey Houses. Then there was the Tonopah-Tidewater Line to Death Valley Junction. From there a spur-line took them to Ryan and then a coach to Greenwater (Furnace Creek). They used to tell me of the adventure which took about a week each way in those days. My folks first took me to Death Valley in the late ’30’s. There is a picture of me at Mushroom Rock (which appeared larger then). In 1963, I moved to Lone Pine (mile 122 on the race course) to practice medicine, where I have been ever since. In 1965, I was offered office space across from Furnace Creek Inn. I went there on my “days off’ during the Harvey Company’s tourist season (October to May) for over twenty five years. At the time I had an airplane (Cessna 205) making the trip easier and more fun. During those years, after seeing patients at the clinic, I would train in and around the area. In the decade from 1977 to 1987, I had (later) heard that there were about 10 individuals (with documented records) who did a solo crossing from Badwater to the top of Whitney (146 miles) as well as about ten others who are on record. 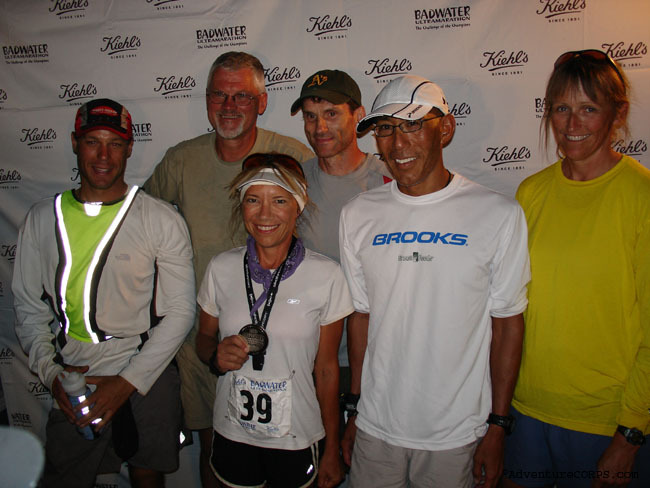 About this time, Hi-Tec Sports USA created a race on the Badwater to Mt. Whitney route in order to promote the “Badwater 146” running shoe. In 1989, seven finished. In 1990, there were seventeen finishers and I knew two runners who had been “invited.” I went out on the course to try to find them but couldn’t as they were doing the “bed and breakfast” version. The first runner I saw was “Marshall.” and, at the time, I thought that was his last name. Later I met other faster frontrunners, followed by those runners “reduced to walking.” My thoughts were, if I just walked, I could do it also. Later, after my first successful “race” in 1991 they were even more impressed that I had taken time out during the race to do an autopsy. It was on a fallen trekker who was not successful in navigating the saltpan of Lake Manley (Death Valley). They also liked the idea that one of my cooling devices was a water-filled casket in a U-Haul truck. These happenings lead to the concept of “Mayor” and “First Lady” of Badwater. After that I had two more successful crossings, in 1992 and 1993. My wife, Denise, also subsequently had three successful crossings, in 1994, 1996, and 1999. Denise and I got married in 1990. 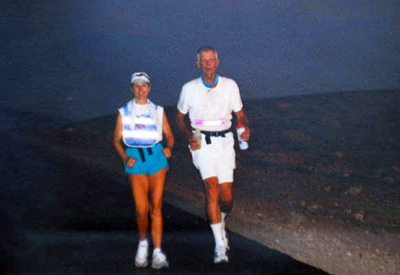 In the early ’90’s, we began to bump into other runners training for Badwater. We began organizing heat-training clinics to help the athletes prepare for the races. We held them on Memorial weekend and Fourth of July weekend each year. Over the years we got to really know the folks who attended and their crew members, pacers, family members, as well as some interesting newbies and wannabes. It made it much more interesting and fun when the race finally happened each year. We were able to provide useful information about replacement of fluids, electrolytes and calories as well as heat adaptation. This has translated into a success rate of about 85% for the attendees. In addition, we have crewed (and paced) runners during some of the races as well as some on their own solo adventures. Denise and I were in the 1994 race as the “Mayor” and “First Lady” of Badater. She was successful in getting to the Portals and to the top of Whitney. I had renal failure and dropped at 41 miles. We both entered in 1996, but as two separate teams. Again, she was successful in making it to the Portals. A storm kept her from making the top that year. I dropped due to exhaustion from overwork and issues of depression (not race related). She was again successful in 1999. 1999 was a big year for media coverage. Kirk Johnson, sports editor for the New York Times, came to our clinic and did the race that year. Following his performance he wrote a book entitled “To the Edge.” Also, “Running on the Sun” was directed by Mel Stuart and produced by Leland Hammerschmitt in 1999. Kirk Johnson, Marshall Ulrich, Lisa Smith, and many others are featured in this production, along with me. I turned 70 at the end of 2002 and decided to try it as the first ever 70-year old in 2003. This time I suffered from the 139 degree temperatures and my own 101 degree internal temperature. I decided, being the only one on call for the Inyo and Mono Coroner’s Offices that I didn’t want to have to do an autopsy on myself. Besides that, I was having hallucinations about being in the Garden of Eden and seeing Mary Magdalene as well as being wrapped in a shroud (of Turin). Other athletic experiences in the area have included the annual Death Valley-Whitney bike race, which I did eight times in a row. In 1991, I ran the first Titus Canyon/Death Valley Marathon (and the four after that). Actually, I had practiced on that course on my own before that. Our further involvement in Death Valley included supporting the following: (1) Marshall Ulrich’s South-to-North Crossing of Death Valley National Monument; (2) Marshall’s Death Valley Solo, Unsupported Crossing (we were present with the camera); (3) Scott Weber in his Oasis-to-Oasis Triple/Quad; (4) Denise helped Rhonda Provost by pacing her up and down Mt. 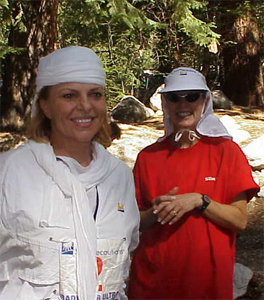 Whitney as the first woman to do the Double Crossing in 1995; (5) Denise crewed Shannon Farar-Griefer as the first woman to do the Double Crossing within the race context; (6) Denise crewed for Adam Bookspan in the South-to-North Crossing in 2002; (7) Denise crewed for Lisa Smith-Batchen with Double Crossing in 2006. 8) Last summer, I had the pleasure of helping Scott Jurek, along with his wife, Leah, with a day of desert training as well as filming his workout performance. I then crewed for Pam Reed during the 2006 race. Denise has crewed for the race and in solo crossings a total of 15 times, which includes 3 double crossings. This led to her to join with Theresa Daus-Weber in writing a book about crewing. “Death Valley Ultras: The Complete Crewing Guide” was published in May 2006. It is a technical guide with a comprehensive collection of information to plan and crew a successful Death Valley ultra with instructions, tips, a list of the known Death Valley crossings, and a photo gallery of views from the Badwater Ultramarathon course. There were two nice publications during 2006. The first was an article featuring me in Best Life (Men’s Health), by Rodale Publications in the March 2006 issue. The title of the article is, “A Prescription for Lifelong Health.” A photographer visited me and took 20 rolls of 12 shots each with his Hasselblad camera using IMAX film; one was used in the article. Then I was interviewed by the executive editor for three hours for the two-page article. The second was a DVD produced by PBS/Nature entitled, “Life in Death Valley.” While they were there on a half-dozen trips, not only did they film the wildlife, but they were also involved in flash floods, a once-in-a-lifetime wildflower display, and the Badwater Ultramarathon. I was pleased to be a part of the feature. Badwater/Whitney has become a way of life for us. Doing the race is not necessarily “good for the body,” but is offset by being good for the mind, soul, and spirit. The concept of adventure racing and extreme sports is here to stay. We enjoy keeping up with our friends and meeting more people who share the same types of adventures. 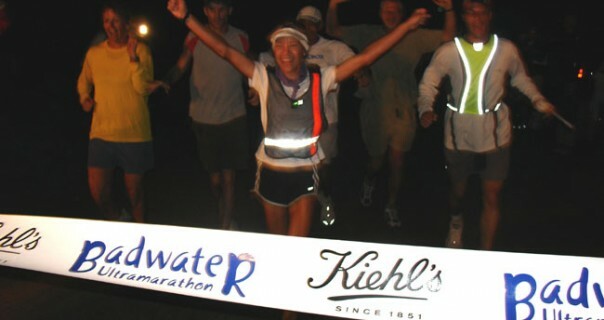 In 2010, Lisa Bliss, crew person, competitor, Medical Director, and 2007 women’s champion, was inducted into the Badwater Hall of Fame. 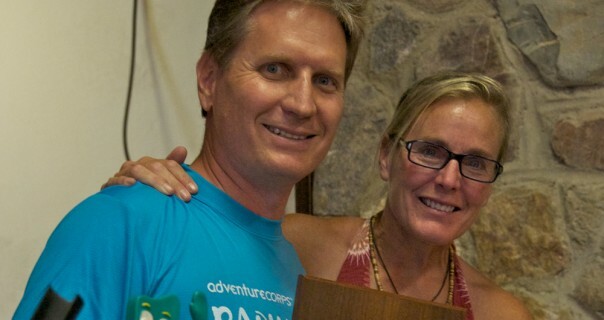 In 2007, Ben and Denise Jones, both of them three-time official finishers, as well as training camp hosts, mentors to many Badwater runners, and more, were inducted. on the race course as athletes camp hosts, volunteers, crew members, Race Ambassadors, and Mayor and First Lady July, 2007. 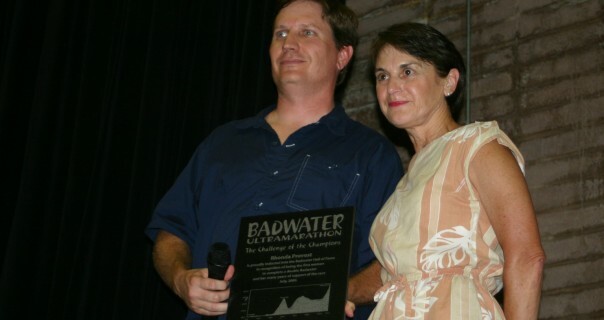 In 2006, Rhonda Provost, who became the first woman to complete a double Badwater in 1995, was inducted. 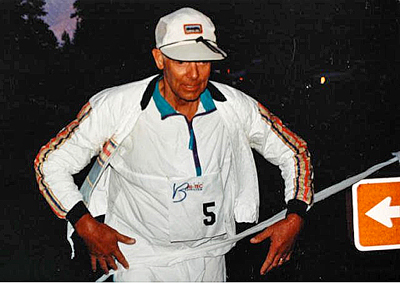 In 2006, Jack Denness, the eleven-time official finisher and first ever 70-year-old finisher (in 2005), was also inducted. 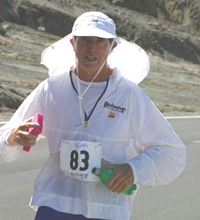 Jack Denness is proudly inducted into the Badwater Hall of Fame in recognition of his eleven official finishes of the Badwater Ultramarathon, including his 2005 finish at age 70 July, 2006. 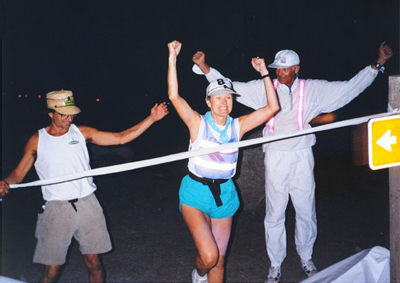 In 2005, Jeannie Ennis, one of the four entrants, and only American female, in the original Badwater race in 1987, was inducted. in recognition of completing the first Badwater Ultramarathon in 1987. In 2003, Jay Birmingham, the second man to ever run from Badwater to Mt. Whitney, breaking Al Arnold’s record in the process in 1981, was inducted. for making it a race in 1981 and again in 2003. 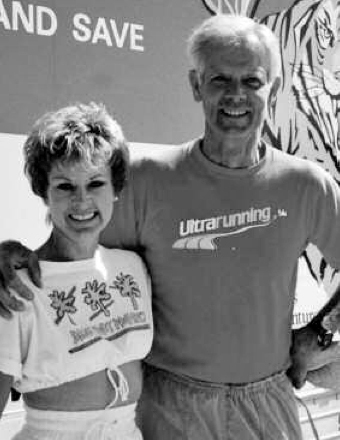 To download and read Jay’s book, “The Longest Hill,” about his 1981 run from Badwater Basin to Mt. Whitney, click here. Read all our Jay Birmingham posts and stories on this website by clicking here.